Simply put, the purpose of XCStats is to enhance the Track and Cross Country experience for high school athletes, their parents and coaches. We strive to help motivate athletes and have them experience success; to engage parents in the sport and increase their awareness of their child's accomplishments; and to save the coach time and give him or her the tools to build a respected and spirited cross country and track program. To help realize this purpose, we focus on three objectives. XCStats certainly didn't discover the concept that recognizing athletes for their accomplishments is motivating. But, we will lay claim to developing an exhaustive criteria by which improvements are identified, and when they are, publicly recognizing them in our reports. It is this recognition that helps motivate high school athletes, and gives them a feeling of success, especially since most athletes times don't count in the official team competition, nor are they finishing near the top of the event. In fact, nearly 70% of XCStats athletes said achieving recognition for their improvement was a motivator for them and that this recognition made cross country/track more rewarding for them. With XCStats, no accomplishment is left unnoticed. 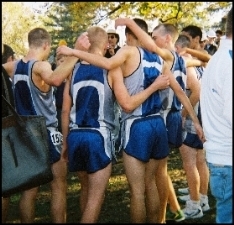 Our goal at XCStats is to recognize accomplishment, for all athletes, whenever it occurs, so that this frequent recognition helps to engrain a spirit of success on the team. With this spirit, all athletes perform better, are more supportive of one another and it's a lot more fun to coach. Recognizing accomplishments goes a long way toward inspiring future performance. But there's more to it. As a coach, you want all your athletes to be engaged in the competition and accountable for their performance, regardless of their skill level. Not such an easy task, especially with a large team and a long season! To this end, XCStats includes a goal-setting tool, where athletes and coaches can collaborate on setting appropriate goals for upcoming races. It seems obvious, but research has shown that goal setting is the most effective way to improve performance, but the process itself is probably more meaningful. When a athlete sets a goal, they are taking ownership for their performance, which gives purpose to their training and adds significance to their result. Setting the goal also involves some interaction with the coach, something that not all athletes have the benefit of. With goal setting, every event counts, kids stay engaged all season long, and their performance improves. It's the track and cross country community, made up of coaches, teachers, athletes, parents and alumni that create a vibrant and sustainable program. XCStats is designed to help build such a program, by highlighting successes and enabling easy and frequent communication. The service includes a complete email system allowing coaches to send emails directly from an XCStats web page. With a few clicks, the coach can send post-event emails to athletes, with a copy to their parents, highlighting their accomplishments. 95% of parents said that XCStats increased their awareness of their child's accomplishments, and 80% said that it helped them feel more involved with the cross country/track team. To increase the dialogue between the community members, we've added a private discussion forum so parents, athletes and coaches can share experiences and discuss topics important to the team. The true purpose of XCStats is to improve the cross country & track experience for athletes, coaches and parents. We hope to inspire athletes, increase parents involvement with the sport and free the coach so he or she can spend more time influencing the lives of our youth. 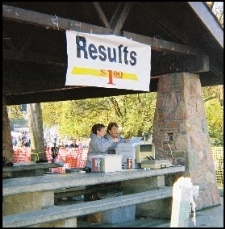 XCStats was developed by me, Mike Sherwood, the father of some cross country runners from San Jose, Ca. It started as a modest spreadsheet in 2004, with the goal simply to keep records of my kids' performances. As the kids progressed through high school, the project grew and became more sophisticated, moving from spreadsheets to databases and now to the web. Developing XCStats.com not only satisfies my hobby of writing XCStats computer programs, but also allows me to expand the availability of the stats which have been so greatly appreciated. XCStats has benefited from the input from several key advisors. Hank Lawson, the champion, historian and leader of cross country in the Bay Area and the track and cross country coach at Lynbrook High School in San Jose, has guided the definition of the reports, provided valuable feedback on the navigation and usability of the site and provided introductions to other influential members of the running community. Hank works tirelessly for the benefit of Bay Area high school cross country and track, including the development and management of the Lynbrook Web site which is the primary source of running information for this region. Dr. Margo Thienemann, a child and adolescent psychiatrist and close friend, has listened to and provided valuable feedback to nearly every aspect of the project. She challenged early assumptions, that when revised, have lead to vast improvements in the site. Her professional experience has helped shape the philosophy and focus of XCStats. And finally, my kids, Scott and Sarah, who have helped with the graphic design, defining the business model and, of course, by choosing to run cross country in high school. Thank you all for helping create XCStats.com.